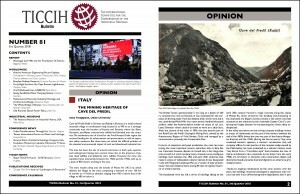 The TICCIH Bulletin is published and distributed electronically to members four times each year. 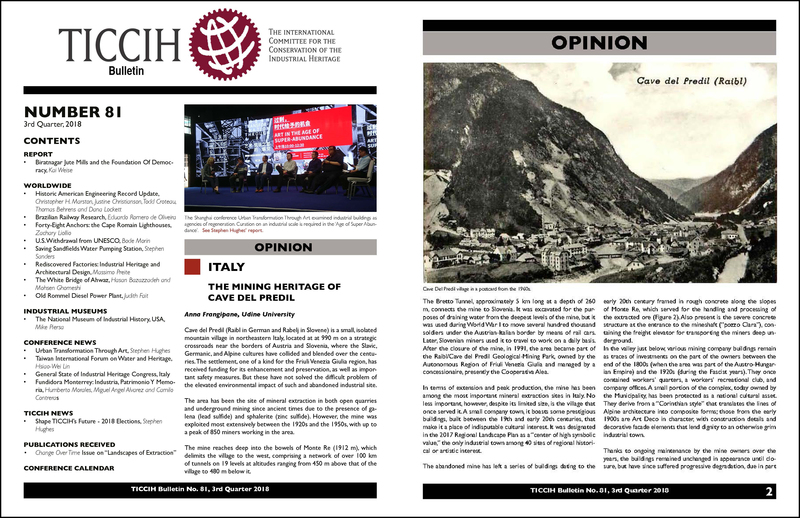 The Editor’s policy is to concentrate on methodological themes of interest in different parts of the world while presenting news of projects, activities, meetings and conferences in which TICCIH members are likely to be involved. JOIN NOW for immediate access to Bulletin No. 81. Also visit TICCIH on ISSUU for a more magazine-like reading experience of many of our back issues. Articles for the Bulletin are very welcome and should be sent to the Editor, James Douet (editor@ticcih.org), as early as possible. Final dates for receiving copy: 31 March for the April Bulletin, 30 June for the July Bulletin, 30 September for the October Bulletin, and 31 December for the January Bulletin. JOIN NOW to view the latest Bulletin! Or follow this link for older issues available online.